I think we stumped quite a few of you with last week's Cue Card at CASology. 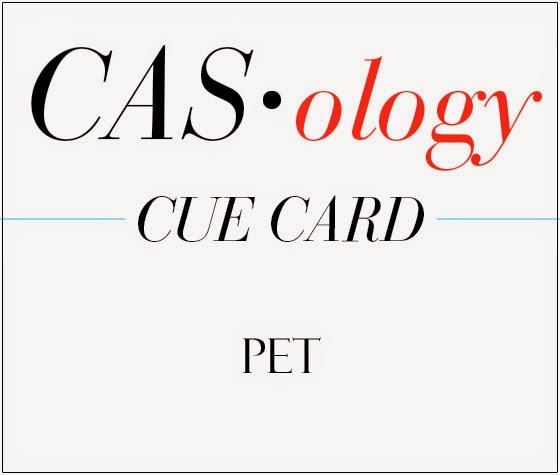 You will be glad to here that this week's is much much easier, this week the Cue Card is 'Pet', see super easy! My first pet was a goldfish, but since I don't have a goldfish stamp I went with my second pet which was a rabbit. Now it's over to you guys, I can't wait to see what Clean and Simple ideas you all come up with this week, but before you get started have a quick visit round the rest of the Design Team for further inspiration. once again you got me with your awesome colour scheme! Such a precious bunny Gillian! Love how you put it altogether! I love your colour scheme, as usual Gillian! Fabulous pet and love the way you pulled it altogether! Perfectly CAS! Love the story-book feel of this! So soft and CUDDLY!!! It looks positively FLUFFY!!!! This is such an adorable baby card! Love the soft colours. This is a very sweet card. I think using brown ink really softens the card, I need to use it more often. This rabbit reminds me of the Velveteen Rabbit! :) LOVE this simply adorable design, Gillian!!! I agree with Melissa, I knew it was something and that is it! Fabulous baby card! Gillian, I agree with melissa, I immediately thought of the Velveteen Rabbit...such a sweet baby card! Thanks for visiting my little blog and thank you so much for any comments you leave. Unfortunately due to the volume of anonymous comments I am receiving I have had to turn that option off in the meantime.